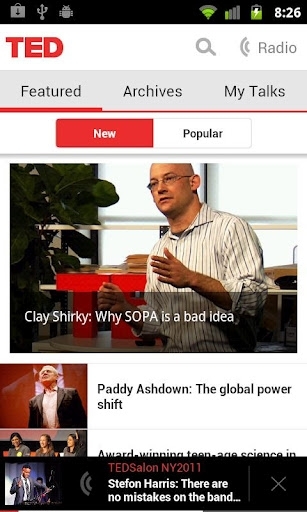 Official TED app for Android released | Android Blast! TED announced its official Android app today. The app allows users to browse and watch the full library of 1,100+ TEDTalks – all categorized, searchable and tagged. Ranging from 3 minutes to 18 minutes in length, TEDTalks share ideas from the world's most fascinating people on everything from technology and design to global issues and entertainment. The new TED app is built for a wide array of Android-enabled phones and tablets, including the new Sony Tablet P "dual screen" and the Amazon Kindle Fire. The design adapts to various screen sizes, making it feel natural and familiar to users across different devices. The app will initially be available in the Google Play Store and the Amazon Appstore for Android. "At TED, we're always looking for powerful new ways to spread ideas," said June Cohen, Executive Producer for TED Media. "With its vast installed user base, the Android platform is an important new frontier for us in our effort to bring new thinking and ideas to even more people." Up-to-the-minute videos: TEDTalks are published daily, and Android app users can see the latest TEDTalks videos as soon as they're available online. Browse + search: Whether they're online or off, users can browse the entire TED library – by theme, tag, rating or popularity – and search for a talk by speaker name or topic. Easy sharing: Users who are inspired by a talk can share it easily over Facebook, Twitter or email. Bookmarks. Users can mark and save talks for viewing later within their "My Talks" tab. Offline viewing: The app is designed to support a mobile lifestyle, in which users move fluidly between online and offline use. Users can download video and audio directly to the device to watch on the plane or other locations where Internet connectivity may not be possible. The full library is searchable in offline mode. Curated audio stream. Out for a jog, multi-tasking, or just interested in listening, TED app users can listen to TEDTalks, either on an individual basis or through TED's curated audio stream.